Synopsis (from Amazon): On the eve of her wedding to Nicholas Young, heir to one of the greatest fortunes in Asia, Rachel should be over the moon. She has a flawless Asscher-cut diamond from JAR, a wedding dress she loves more than anything found in the salons of Paris, and a fiancé willing to sacrifice his entire inheritance in order to marry her. But Rachel still mourns the fact that her birthfather, a man she never knew, won't be able to walk her down the aisle. Until: a shocking revelation draws Rachel into a world of Shanghai splendor beyond anything she has ever imagined. Here we meet Carlton, a Ferrari-crashing bad boy known for Prince Harry-like antics; Colette, a celebrity girlfriend chased by fevered paparazzi; and the man Rachel has spent her entire life waiting to meet: her father. Meanwhile, Singapore's It Girl, Astrid Leong, is shocked to discover that there is a downside to having a newly minted tech billionaire husband. A romp through Asia's most exclusive clubs, auction houses, and estates, China Rich Girlfriend brings us into the elite circles of Mainland China, introducing a captivating cast of characters, and offering an inside glimpse at what it's like to be gloriously, crazily, China-rich. One (or more) Sentence Summary: Crazy Rich Girlfriend is just crazy good! Great story with crazy twist. I loved all the characters too. Crazy clothes, apartments, cars, and lifestyle made this so much fun. I didn't realize this was a sequel. 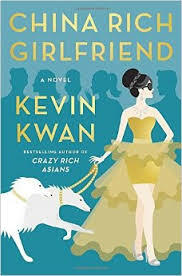 Fast read/slow read: I listened to China Rich Girlfriend on Audible. Would I Read Other Books by the Author: I would. I just found out there is Crazy Rich Asians by Kevin Kwan and I want to check out.